Please can you give me the number of the black cartridge and the number of the colour cartridge for the PSC 1110 printer? The HP PSC 1110 printer can use a HP 56 high capacity or light-user black cartridge or a HP 27 black cartridge. It also uses a HP 57 high capacity tri-colour or light-user ink cartridge or a HP 28 tri-colour cartridge. Any of these cartridges (shown above) can work in the PSC1110 provided that you have one black and one tri-colour cartridge installed. Which cartridge can I use for the HP PSC 1110? Any of the cartridges listed on this page are compatible with the HP PSC 1110 All-in-One printer. The PSC 1110 requires that you install one black and one tri-colour cartridge. There are different options for black ink and for tri-colour ink because there are a range of cartridges that can print in black or tri-colour. The only difference between them is how much ink they contain. For instance, you can choose to buy a HP 28 standard capacity tri-colour cartridge or a HP 57 high capacity tri-colour cartridge depending on how much ink you use and how much you'd like to spend. This compact multifunction printer is integrated with a copier and a scanner to offer more value for your money. Aimed at the home user, it promises high-resolution prints and versatile printing options. Users still complain about the sluggish print speed and the performance of the HP PSC 1110. HP gave the PSC 1110 a compact body that weighs 11 lbs and measures 16.8 inches wide. At 6.7 inches, it is quite short, and its diameter of 10.2 inches allows it to fit even small desks and cabinets. The HP PSC 1110 relies on colour inkjet technology, which uses the traditional ink system. The scanner's resolution can be enhanced to 19200x19200 dpi, while the printer's maximum resolution goes up to 2400x1200 dpi. The control panel is intuitive even for first-time users. This device can be a standalone copier, which is convenient when a computer is not present. 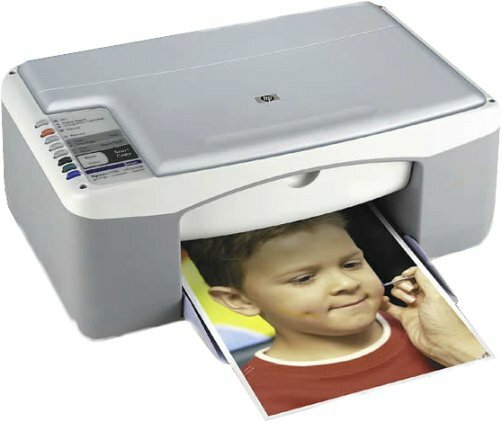 The HP Photo and Imaging Software is included in the package, so you can get creative with pictures and even turn them into iron-on transfers, wallet-sized prints, and sticker prints with the HP PSC 1110. The intelligent scanner of the HP PSC 1110 is integrated with an optical character recognition program, so scanned documents can be transformed into text, which you can edit later. The speeds of both the digital copier and the printer are not impressive at only 6 to 8 ppm (even slower at 'best' mode). The HP PSC 1110 is limited to USB 2.0 only, and it runs into compatibility issues with Windows 7 computers. The monthly duty cycle is a maximum of 1000 pages, which is low compared to other multifunction printers from the same manufacturer.